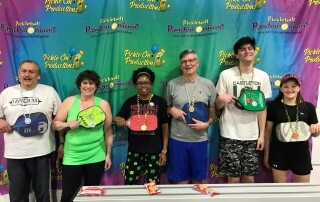 Dive into Pickleball at The Mill Works! 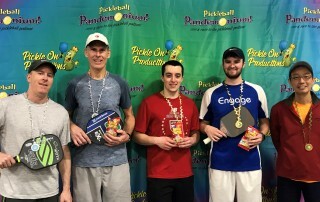 Whether you prefer the social aspects of the game, the opportunity to stay active, or the fast-paced thrill of competition, pickleball has something for everyone! This is a fun sport for all ages and skill levels that combines elements of tennis, badminton, and ping-pong. The rules are simple and easy to learn. 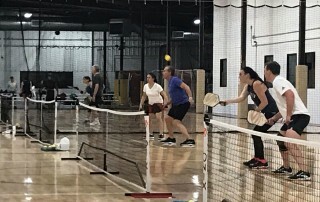 Pickleball is played on a badminton-sized court with a slightly modified tennis net, a paddle, and a plastic ball with holes, and can be played either as doubles or singles. Please note… Pickleball at The Mill Works is primarily a daytime activity. While we do provide some space for pickleball in the evenings, we only guarantee 3 pickleball courts on any evening posted for pick-up play. Want to receive emails from The Mill Works with pickleball news and updates? Please send your full name and email address to carolyn@millworkswestford.com and we’ll add you to the list. We provide the following options for pickleball. Please see the calendar of this month’s offerings below. All times specified on this calendar are included with your membership or daily drop-in fee, provided you play by the rules outlined below. If you wish to play pickleball at other times, or not in accordance with our posted rules, you can call and reserve a court, subject to availability. $30/one pickleball court or $60/ three pickleball courts per hour. 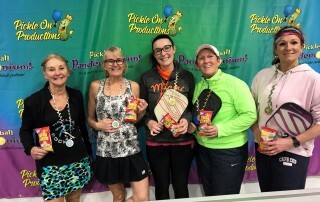 These are times when there will be other folks on the courts, allowing for round-robin play and a chance to get more involved in Mill Works pickleball. 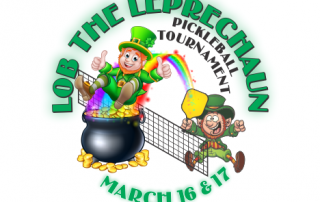 Anyone playing pickleball on courts reserved for pick-up play must join the group and follow the posted rotation rules in the spirit in which they were intended. Combined pick-up: Everyone rotates between courts, as described in the posted pick-up rotation rules. This is called Pick-Up on the calendar below. 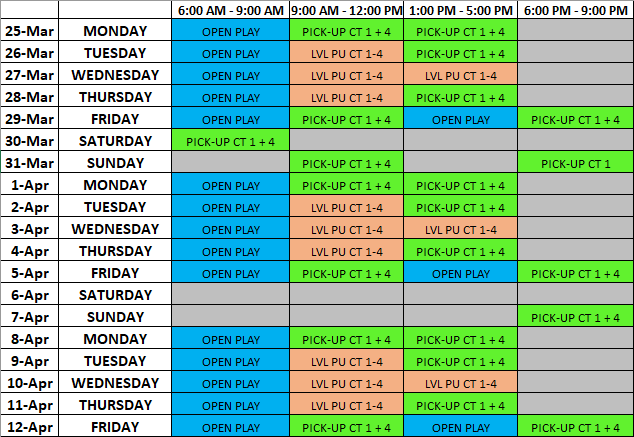 Leveled Pick-up: Similar to combined pick-up, except that 3 courts will be reserved for beginner play, and 3 courts for more advanced play. You choose which group you want to play in. Advanced is a subjective term and is in no way related to ratings. This is called LVL PU on the calendar below. During open play, 6 pickleball courts (2 basketball courts) will be reserved for private groups on a first-come basis. Players must relinquish their court after 2 games if others are waiting to play. 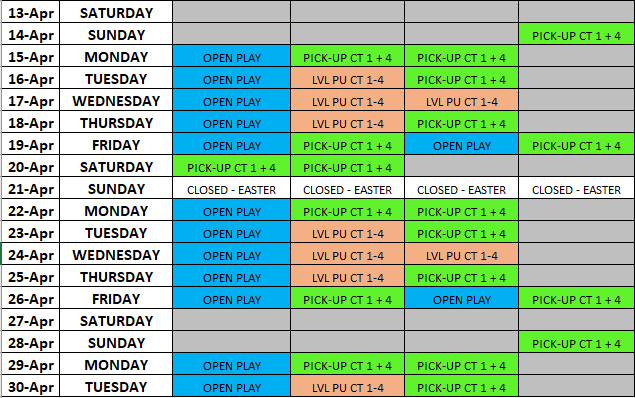 Pick-up rotation rules need not be followed during open play. This is called OPEN PLAY on the calendar below. Pickleball Only Membership: See our Memberships page for detail, or email us at info@milworkswestford.com. New to pickleball at Mill Works? We have many pick-up times reserved, see calendar below. All levels and abilities are welcome, so come over and play and get acquainted with our program. Never played pickleball? We offer a $25 one-hour introductory session for folks who would like to try this great sport for the first time. Email info@millworkswestford.com for details. Want a lesson? Small, semi-private group lessons are available with pickleball instructor Paul Lambers. These lessons are perfect for groups of 2-6 players and result in better pickleball skills. Get a group together with players of similar playing ability, schedule your lesson and prepare to learn while having fun! Each lesson lasts approximately 2 hours, $25 each player payable to the front desk. 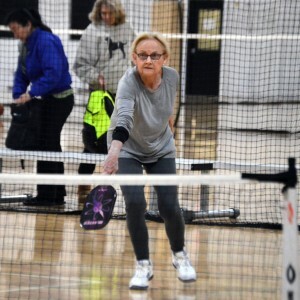 The lessons consist of pickleball strategies, drills, ball machine work, or even having the instructor play games with your group and give you feedback. email us at info@millworkswestford.com and we can plan a lesson for you. 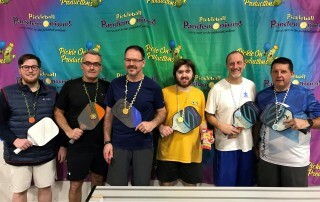 Here are some pictures from our recent Lob the Leprechaun pickleball tournament. Beverly Russo, a former Special Educator, has a deep passion for pickleball. She has quickly achieved success, represented by medaling in over a dozen tournaments, with highlights of her experience including winning gold in both the Mixed Doubles and the Women’s Doubles in The 2017 NH Masters Games. Beverly is a skilled dinker, consistent ball striker, and loves to attack. She will teach you dinking skills, positioning, and the basic strategies for success! Paul Lambers has been playing and teaching pickleball for over 10 years. Through the YMCA and the Town of Andover, Paul has introduced and taught hundreds of people the game of pickleball. His lessons are both exciting and informative, and he makes difficult concepts simple to learn and remember. Paul has also played in over 50 tournaments, medaling in and winning many of them. He has played in tournaments across the U.S. and has had the opportunity to play against some of the best players the sport has to offer!